Originally opened in 2015 as a high-end location for users to browse various models of the Apple Watch, particularly the gold Apple Watch Edition, Mac4Ever is now reporting that Apple will close its location in Galeries Lafayette effective January 2017. 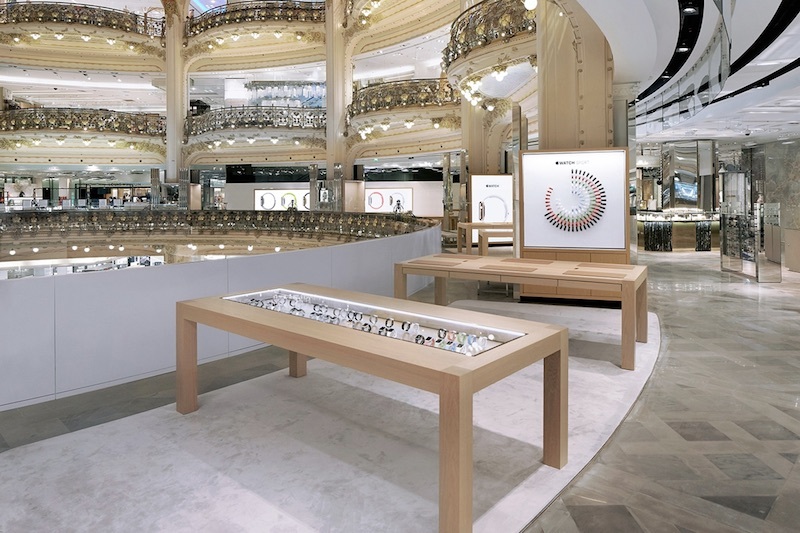 A number of upscale department stores launched Apple Watch pop up shops when the original wearable device debuted in 2015, including Galeries Lafayette in Paris, Selfridges in London, and Isetan in Tokyo. Today's report cites a lack of sales at the Apple Watch-centric shop, along with an apparent reduction of employees over the past few months that had been in preparation for its January closure. The remaining employees will be given jobs at Apple retail stores around Paris once the pop up shop officially closes, including Apple's future location in Saint Germain, expected to open by the end of the year. The status and potential closing dates of the other luxury Apple Watch shops was not confirmed. The shops were some of the select few locations that users could browse and purchase the high-end Apple Watch Edition, which in Series 0 began at $10,000 and went up to over $17,000. The "shop-in-shops" were noted as being located in easily visible areas in each department store, nestled next to other high quality brand locations, and ensured that "customers looking to make major purchases" only received "the best service possible." These locations only handled Apple Watch viewing and sales, however, with customers getting directed to other Apple retail stores for their support needs. With Apple's shift to health and fitness over fashion and luxury in Apple Watch Series 2, it makes sense for Apple to eliminate its high-end pop up stores that were marketing mostly in the now-retired gold Apple Watch Edition models. With Series 2, Apple's new Edition device comes in white Ceramic and is noticeably cheaper, beginning at $1,250 for 38mm and rising to $1,300 for 42mm. I never did picture this chunky and awkward watch as a fashionable luxury item. But Angela's $50 million salary worth expertise said this was the way to go! Super fashionable magic high-end luxury prestige! It's still a mostly useless device whose function is redundant if you carry a smartphone. The fitness features are very much behind wearables that are specifically geared toward fitness--and they are cheaper. Too bad Apple has been spending so much time on this useless thing while neglecting innovation and attention to their other products which actually sell. the Apple bubble is popping. Please Apple focus on core business. Pop-up shops... also known as Don't-Make-Eye-Contact Shops... not surprised. I feel it'd give off the impression that it isn't authentic. What, too few fools parting with their money... Maybe there is a future for us all. Still, it's only showing the truth. If you need to go to a quiet place in an Apple store, go to a watch table. “Fashion is a form of ugliness so intolerable that we have to alter it every six months.” Oscar Wilde. Apple Watch made in China under questionable conditions. Not a luxury item. No place for it in Galeries Lafayette.